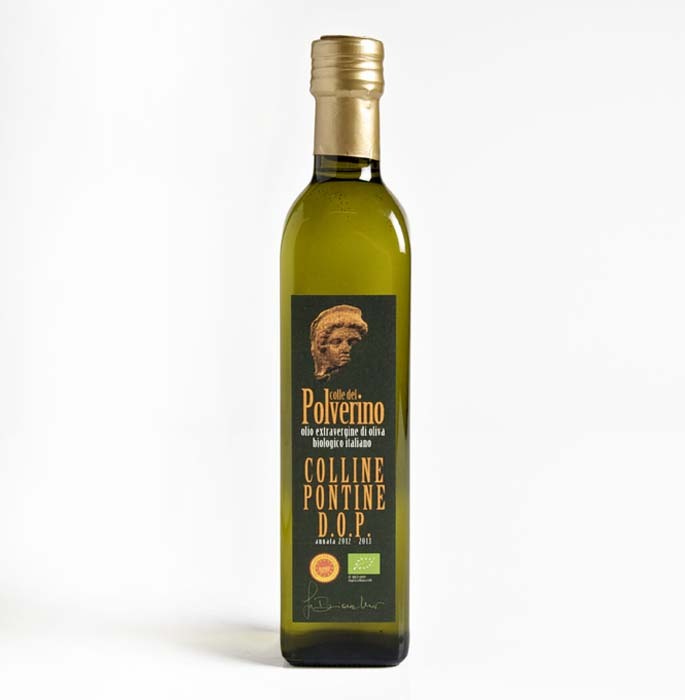 "Colle del Polverino" olive oil is the result of a careful and meticulous work that involves a long lasting commitment and love for the land. It is obtained from olives harvested by hand at the right point of ripening and pressed within 12 hours of harvest, which results into a very balanced product that enhances the taste of food and is soft on the palate. Our excellent monovarietal oil is obtained from the Itrana variety olives which, besides giving us a product with unique characteristics, are also used for the production of table olives known as “Gaeta Olives". This type of olives are another excellence of our territory. The organic management, an obvious choice from the outset, has been dictated by the desire to safeguard health and the environment. Its name originates from "The Polverino Woods", which completely surrounds the olive farm, is a valuable natural area which has been identified as a site of community interest. It is an intense limpid golden yellow color with warm green hues. Its aroma is tomato and artichoke , with fruit hints of average maturity and fragrant hints of basil and field balm. Its taste is elegant and vegetal, with a flavour of counry vegetables, broad beans, celeri and sweet almond finish. bitterness and pugency are present and harmonic. It would be ideal on bean starters, salmon carpaccio, chicken salads, marinated fish, mushroom soup, mushroom salad, first courses with vegetables, stewed shellfish, grilled fish, baked and grilled meat, pasta filata fresh cheese.